It Begins With a Cookie! "IF YOU GIVE A MOUSE A COOKIE.... Chances are he's gonna want a glass of milk to go with it; and so the story goes, or should I say grows, as one thing leads to another in the book. Well I happened across a baking dish the other day, whose center was stamped with the words "Baked With Love". How perfect for a baker's home, and so I purchased it. 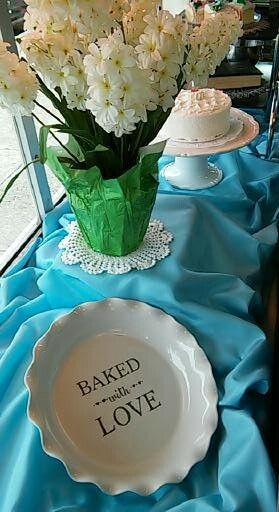 Then like the cookie the mouse ate, I started thinking that the "Baked With Love" dish would look great in the bakery's window. Then like the glass of milk that had to go with the cookie, my baking dish needed a companion or two, or three, or four,....! So a blue satin drape which matched the blue of the dish came out of storage to fancy our window sill. Next, a cake on a cake-stand and a few flowers. Course I should have thought FLOUR, not flower since a baking theme emerged. BAKING requires bakers and so my thoughts turned to pictures which then reminded me of a customer who was just in the store the other week. Den from DSP Photography had taken pictures a few years ago for a contest he had entered. Haegele's was the subject of his lens and he captured our Baker Fred on a great angle lined up with baking pans, busy at work. Just the right picture!!! Oh that proverbial "cookie"... ! I of course, had to find the picture and frame it and put it in the window, because... it goes perfectly with the whisk, that goes with the mixing bowl, that goes with a pan, that goes with some sugar, and flour... no flowers which go with a cake on a cake-stand that sits on a drape that matches the color of my "Baked With Love" dish. Like the mouse, I sat for a moment and thought I was done. But did you know that you can "Give A Moose A Muffin" and a "PIG A Pancake" too??? Well, the icing on the cake always comes last and so it was with the "Sweet Life" display. The picture below, now sits on our glass counter with a caption "LIFE IS SWEET". 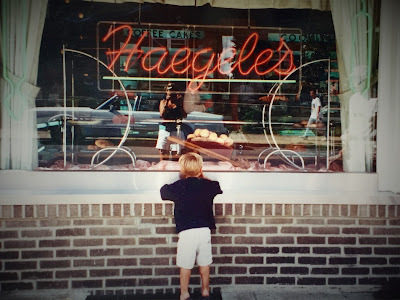 The picture was sent to us by a customer who responded on facebook with memories of her entire family growing up on Haegele's treats. She was reminded of a snap shot she had taken years ago and likewise searched for the picture to forward it to us. I had to frame it, of course! An absolutely precious and perfectly captured moment. 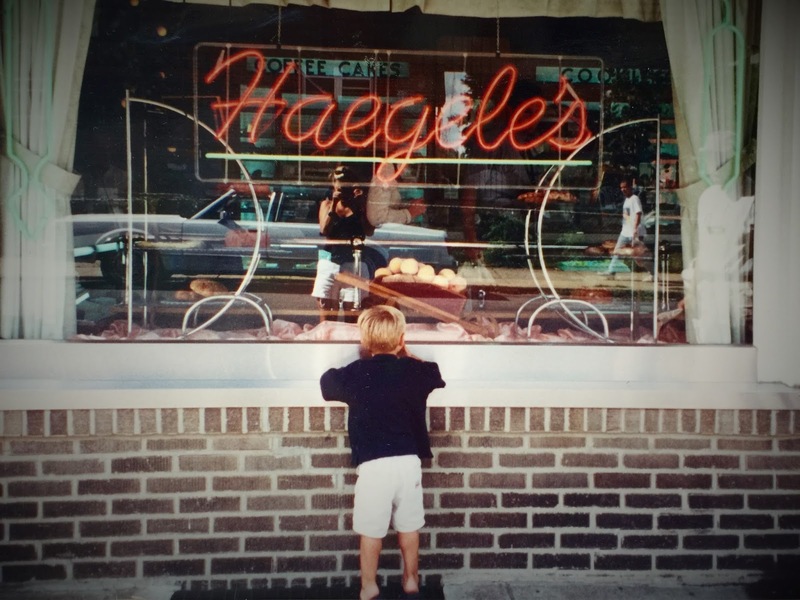 Her son so sweet, nose pressed to glass, standing on tippy-toes, peeking in Haegele's window to watch his grandmom buying goodies. Caleb then two, is now 18 and graduating from high school. It's amazing how fast the pages of time seem to lead one right into another. But, Life is indeed sweet, especially when such thrills can come from a cookie (or should I say baking dish? ).